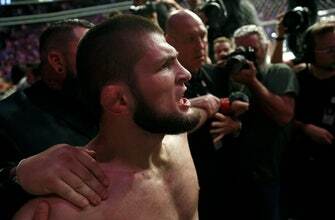 UFC fighters Khabib Nurmagomedov and Conor McGregor are being suspended by the Nevada Athletic Commission for a brawl that occurred after their lightweight title fight last weekend in Las Vegas Letters were sent informing both fighters that they will be suspended for at least 10 days effective Oct. 15, commission executive Bob Bennett said Thursday. A commission investigation is pending and the panel can extend the temporary suspension when it meets Oct. 24. Nurmagomedov and McGregor could also appeal Bennett’s executive action at that time. Earlier this week, Nurmagomedov’s $2 million for the fight was withheld by the commission pending the outcome of the investigation; McGregor received his $3 million purse. UFC President Dana White also said three members of Nurmagomedov’s camp were detained by police but released, because McGregor refused to press criminal charges. White said the UFC might strip the lightweight title from Nurmagomedov, as well.